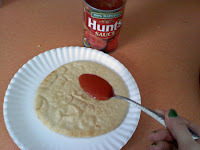 These are a major favorite for lunch at our house. 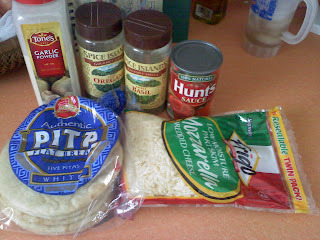 The pita flatbreads cost $1.59 for a pack of 5 (at Joseph's Marketplace). I had the spices, sauce & cheese on hand. This is more of a method than a recipe. 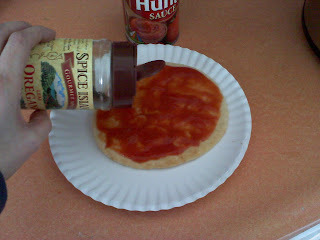 I've used bbq sauce & leftover chicken to make bbq chicken pizzas...leftover bacon? Yes. Veggies? Yes! 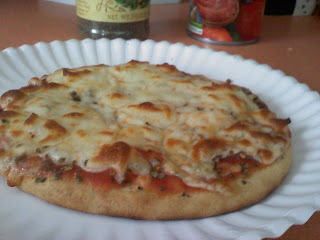 The plain cheese pizzas are really easy though and sooo delicious. 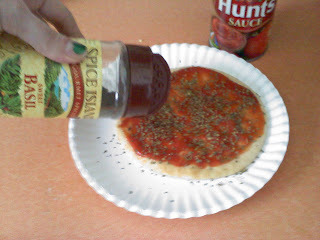 Take a couple tbsp of tomato sauce & spread on the flatbread evenly. 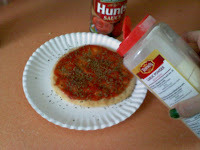 Sprinkle with oregano, basil & garlic powder. 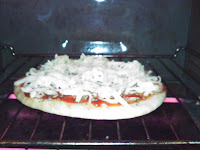 Top with shredded cheese & pop in the toaster oven for about 5 minutes. DONE! They are really fantastic. Kids love them. My big kid (aka husband) ate two today. They end up being about $.50 each if you include the cheese & spices. Would you rather eat this or 1/2 of a bean burrito from Taco Bell? Yeah. I thought so.